You need to know some good Spring cleaning tips if you are a dog owner. As you know, your pet can make quite a mess after running around a wet, messy lawn. They tend to track a lot of dirt and mud into your home. Of course, that won’t stop you from letting them get some much-needed outdoor exercise, but it can make cleaning a hassle. 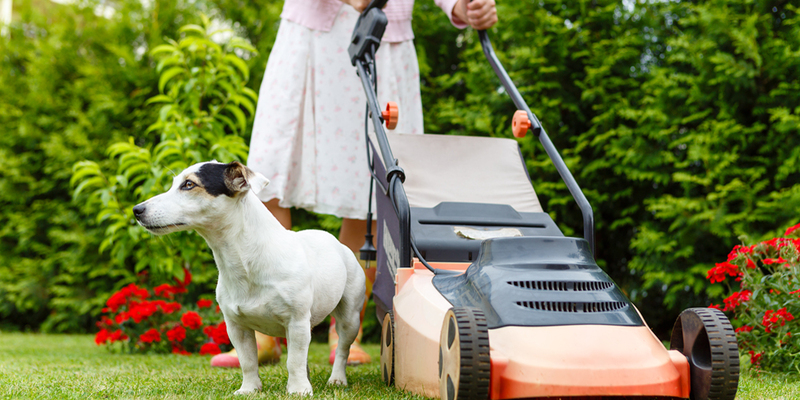 One Spring cleaning tip for dog owners is making the switch to an artificial turf lawn. Artificial turf isn’t like real grass. It doesn’t get muddy after the rain. It also doesn’t need much lawn care, since it stands up to the kind of damage a big dog can do to a grass lawn. On top of that, because it remains even and mud free in all-weather, artificial turf is a much safer and cleaner area for pets to play. If you’re thinking about installing it in your yard, SF Bay Area experts Watersavers Turf offer a product line perfect for you and your best little buddy or buddies. A real grass lawn is costly to maintain. You need to water it, which drives bills up. You need to mow it, which means spending money on a mower. If you want it to look its best, you need to buy seed or hire a lawn care crew. These costs go up even more if you have a pet. When they sprint back inside after playing in the yard, they’re bound to make a mess. Cleaning it up takes both time and money. Synthetic turf provides a cleaner area for an animal to play on. This reduces the amount of dirt that is being tracked into the house every time they go outside. Muddy paw prints can be cute, but not when they are all on your floors, and you are constantly cleaning up after them. On top of that, synthetic turf keeps lawn care costs down. It doesn’t need the same kind of upkeep as real grass, so you can spend more of your money on keeping a pet happy. With a synthetic turf lawn, you can spend those extra funds on dog toys, or trips to the vet. If your garden is now mostly dirt, installing fake grass will provide a cleaner area for your pet to play. Providing them with plenty of toys will keep them occupied and not looking for areas to dig if this is a problem. Doing this will keep paws cleaner and save some of your plants as well. That said, you may decide you want to still keep your other areas in your garden natural. To protect those areas from your dog, scatter citrus peels. These will help repel them from garden areas where you don’t want them to play. Your pets will instead focus on the fake grass area. It also makes for a nice scent in the garden. After they’re done playing, you also won’t need to worry about repairing the lawn. One of the most appealing things about fake grass is that upkeep takes no time at all. It looks and feels real, so you don’t need to put effort into keeping it green. This is a big plus if you want your home to look well-kept. It also helps keep the inside of your house clean, since pets can’t track dirt into it. Fake grass is also safe for your pet to play on because no chemicals are being used. To keep your synthetic grass looking its best, remove any debris that collects on it such as leaves and branches. Remove all solid pet waste to keep it looking and smelling fresh. You can also use ZeoFill Sand, which is organic, natural, and safe infill. It serves to get rid of odors, and it quickly absorbs moisture so that you will always have a fresh smelling garden area. To learn more about how artificial grass can make life better for you and your pet, get in touch with us at Watersavers Turf for a free estimate. You can also give us a call at 844-974-8873, or chat with one of our reps online to find out how to get free 1’ X 1’ samples. To see for yourself how helpful our products can be, please stop by one of our SF Bay Area locations. We’ll be more than happy to answer all of your questions.